Whisk together all of the ingredients except for the tempeh. Place the tempeh in a lidded container and pour the marinade over the top, making sure to coat each piece. Place in the fridge to marinate at least 2 hours, but preferably overnight. The next morning, add a little more oil to a nonstick skillet over medium heat. Add in the tempeh in a single layer and cook until the bottom side is golden brown, about 5-10 minutes. Flip the tempeh and repeat on the second side. Add in the liquid from the marinade and cook until the tempeh has absorbed all the liquid and is shiny and sticky. 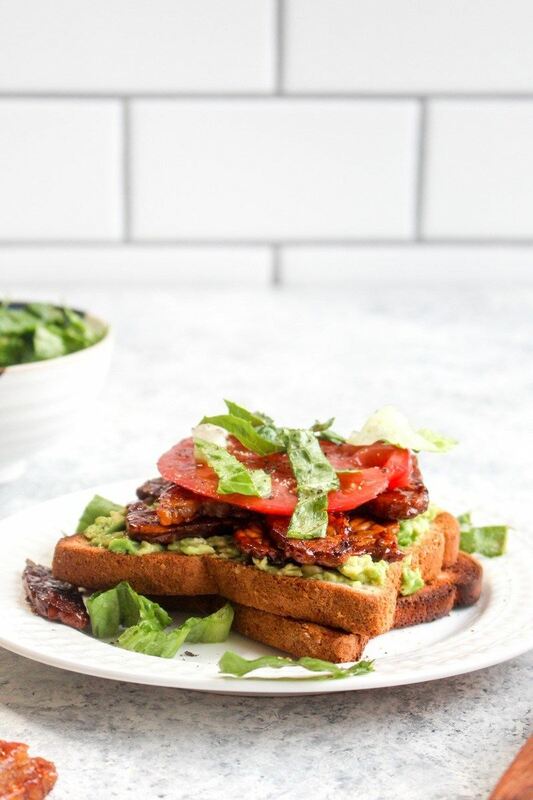 Use immediately for your BLT avocado toast or place in the fridge for fast morning breakfasts. Add the bread to the toaster and toast until golden brown. Mash the avocado onto the bread. Season with a sprinkle of salt and pepper. Add on a few strips of tempeh bacon, the tomato, and the sliced romaine. Sprinkle with a bit more salt and pepper and enjoy!